WESTLAKE VILLAGE, CA, July 29, 2013 — Guitar Center Professional (GC Pro), the outside sales division of Guitar Center that focuses on the needs of professional users, is pleased to announce that the RAVEN MTX Multi-Touch Production Console by Slate Pro Audio has begun shipping to market. Originally shown at the 133rd AES convention by Slate Pro Audio, the RAVEN MTX has been acclaimed by leading engineers, producers and journalists worldwide as the next-generation audio console. The RAVEN MTX Multi-Touch Production Console is the ultimate centerpiece for the modern studio, combining a state-of-the-art multi-touch display, feature-rich multi-touch DAW control software, and a world-class analog monitor section. The console features a 46-inch touchscreen that provides direct touch access to every aspect of the production process, from recording, editing, plugin control, MIDI composition, and final mixing. The console’s RAVEN MIXER software is a powerful multi-touch mixer that can control all major DAW’s, and the RAVEN TOOLBAR provides intuitive control familiar to slick mobile computing devices. The console facilitates quick navigation through any virtual production environment. Raven’s high-quality digitally-controlled analog monitoring section delivers multiple inputs and outputs, plug-and-play integration with digital audio interfaces and multichannel artist cue mix systems, 7.1 surround capability, and on-board Laptop Reference™ speakers. For more information, please visit www.gcpro.com and www.slateproaudio.com. 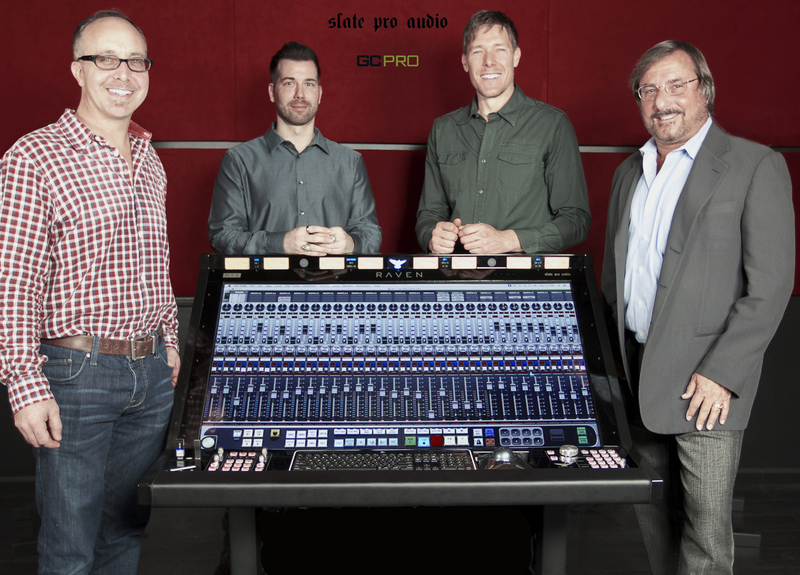 Photo Caption: Shown L-R: Derek Snyder, GC Pro Director, Western Region; Steven Slate, co-inventor/CEO, Slate Pro Audio; Alex Oana, co-inventor/V.P. of Creative Operations, Slate Pro Audio; and Rick Plushner, GC Pro Vice President. Based in Los Angeles, California, Slate Pro Audio creates innovative, hand-built-in-the-USA, no-compromise, flexible products, to help make better-sounding, more creative recordings. Guitar Center is the leading United States retailer of guitars, amplifiers, percussion, keyboards and pro-audio and recording equipment. Our retail store subsidiary operates 250 Guitar Center stores across the United States. In addition, our Music & Arts division operates 101 retail stores specializing in band and orchestra instruments for sale and rental, serving teachers, band directors, college professors and students. We also are the largest direct response retailer of musical instruments and related products in the United States through our wholly owned subsidiary; Musician’s Friend, Inc., and its catalogs and owned or operated websites. More information on Guitar Center can be found by visiting the Company’s website at www.guitarcenter.com.